Surfactant Protein A antibody LS-B2543 is an unconjugated mouse monoclonal antibody to human Surfactant Protein A (SFTPA1). Validated for ELISA, IHC and WB. Tested on 20 paraffin-embedded human tissues. Cited in 1 publication. Native SP-A purified from bronchioalveolar lavage from proteinosis patients. Recognizes human pulmonary SP-A. In Western Blot after SDS-PAGE it reacts with reduced forms of SP-A and weaker with non-reduced forms. In immunohistochemical staining from paraffin embedded tissue samples, this antibody reacts specifically with human SP-A. 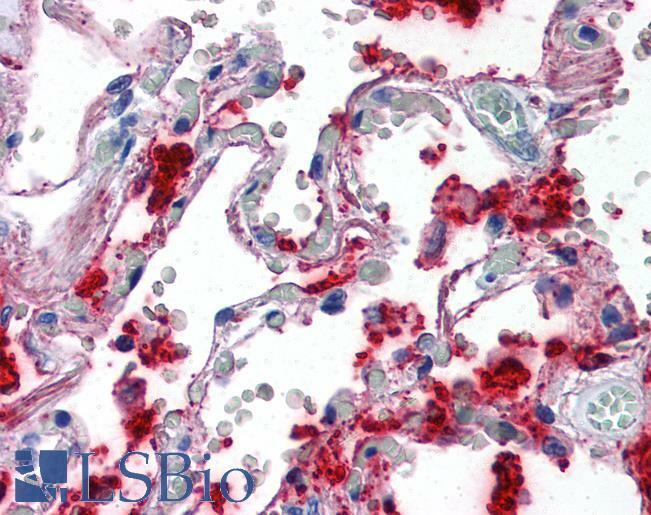 Immunoreactivity is seen with alveolar type II cells, nonciliated bronchial cells and a subset of alveolar macrophages. 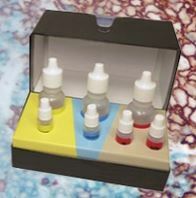 No reactivity in samples from pancreas, intestines, thymus, prostate gland or the peritoneal cavity lining cells. Reacts strongly with SP-A when tested in ELISA with SP-A directly coated onto the microtiter well. Immunohistochemistry: LS-B2543 was validated for use in immunohistochemistry on a panel of 21 formalin-fixed, paraffin-embedded (FFPE) human tissues after heat induced antigen retrieval in pH 6.0 citrate buffer. After incubation with the primary antibody, slides were incubated with biotinylated secondary antibody, followed by alkaline phosphatase-streptavidin and chromogen. The stained slides were evaluated by a pathologist to confirm staining specificity. The optimal working concentration for LS-B2543 was determined to be 10 ug/ml. Anti-SFTPA1 / Surfactant Protein A antibody IHC of human lung. Immunohistochemistry of formalin-fixed, paraffin-embedded tissue after heat-induced antigen retrieval. Antibody concentration 10 ug/ml.